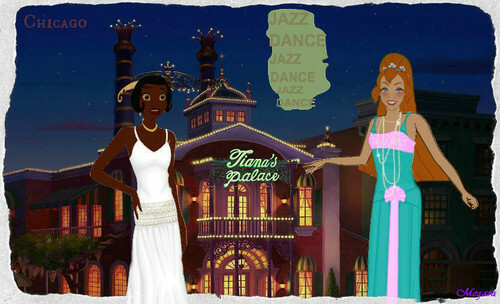 Tiana's Palace. Tiana's Palace is the most लोकप्रिय club in Chicago. Come see the one and only Thumbelina sing every night; accompanied द्वारा jazz guitarist Naveen of Maldonia. (Another promo for my story, "Chicago": Coming soon.. HD Wallpaper and background images in the डिज़्नी क्रॉसोवर club tagged: disney crossover tiana thumbelina fan fiction chicago.